The big question entering Tuesday night’s game at KeyBank Center centered around which Buffalo Sabres’ team would show up to play the New Jersey Devils. Would it be the team that suffered one of the worst home losses in franchise history in its last appearance in the building, a 7-1 loss to Dallas that left onlookers at a loss for words? Or would it be the team that ran off three straight wins on a swing through Western Canada, allowing no even-strength goals along the way and even finding a scoring touch? Naturally, in real life this is not an either/or proposition. Dramatic and lasting turnarounds are rare. The Sabres’ body of work throughout the whole season indicated that it was likely they would return to their ways of falling short of a victory. That’s exactly what happened in a 3-1 loss before 17,460. It seemed like a good opportunity for Buffalo to continue the brief revival. The Devils came into the game on a four-game losing streak, and two wins in their last 11 starts. New Jersey was the team that looked like it wanted the victory more. It was a curious game in that there wasn’t a great deal of excitement all the way around. Those in the audience probably expected the Sabres to come out with a little jump after the big road trip. The first period was a well-deserved 0-0 tie, and even less happened in the second period – although a goal was scored. Miles Wood of the Devils took a pass on left wing in full flight, got around the defense, and beat Robin Lehner with a sharp backhander. The goal ended Lehner’s shutout streak at 145 minutes and 15 seconds, and the Sabres’ team shutout streak at 199:19. Taylor Hall got open in the third period in the slot for the Devils, and Lehner didn’t get enough of a piece of the puck to prevent it from going in. Two goals looked like plenty for goalie Keith Kinkaid with six minutes left, as the Sabres rarely had threated through that point. The Sabres have figured out a way to make games like this at least interesting most of the time, and they did it again Tuesday. McCabe scored on a power play to make it a one goal game with about five minutes left. 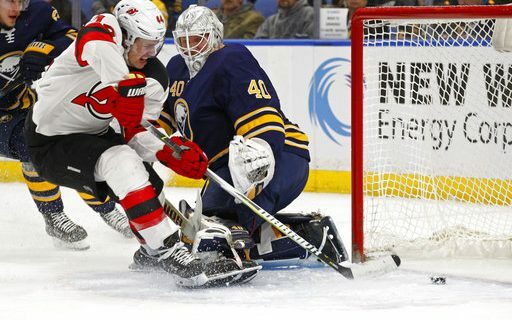 Then when Nico Hischier of New Jersey picked up a penalty with 2:45 left – the Devils’ fourth minor penalty of the night to the Sabres’ zero – a deadlock seemed possible. Buffalo’s Ryan O’Reilly almost got that tying goal during the power play. Almost. Once Kyle Palmieri wrapped things up for the Devils with an empty-netter in the final seconds, the Sabres’ attention returned to one of their biggest problems this season – their record at home. Buffalo fell to 6-13-3 in its friendly confines, similar to its 8-14-6 record away from home. Conventional wisdom says that teams should be better on their home ice, but it hasn’t worked out that way. “On the road trip, we were better than this,” O’Reilly said. “At home, it’s like we’re thinking too much. It’s frustrating. We’re at home, and we can’t take advantage of it. The Sabres will have plenty of chances to do that. This was the first of five straight home games. Florida comes to town on Thursday night. This wasn’t the only hockey game in Buffalo that Budd saw this weekend. Read about his trip to the Beauts game.